Each and every day, we’re reminded of the fragility of human life and the importance of our nation’s security. Freshest in our minds, is the recent terrorist attack in Brussels. 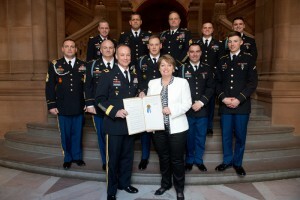 Senator Ritchie is pictured presenting a resolution commemorating 10th Mountain Division and Fort Drum Day to General Brigadier General Paul Bontrager. It’s tragic news like this, that reinforces the importance of the sacrifices made by the men and women who fight for our freedom, including the troops of the 10th Mountain Division. Just recently, I hosted “10th Mountain Division and Fort Drum Day” at the State Capitol to raise awareness about the important role Fort Drum and its soldiers play in our region, state and nation. This special event, which has taken place five years in a row, helps to teach my colleagues, legislative staff members and visitors to the Capitol about the mission of the 10th Mountain Division and the positive impact Fort Drum has on our region, as well as our entire state. The event also has another purpose, and that’s to give my colleagues and I an opportunity to express our gratitude to troops and their families for the tremendous sacrifices they have made to protect our freedom. This year’s 10th Mountain Division and Fort Drum Day was bigger and better than ever. More than 30 troops made the trip to Albany for the event, including Brigadier General Paul Bontrager, Acting Senior Commander of the 10th Mountain Division, Garrison Commander Colonel Bryan Laske and six troops who are native New Yorkers. The highlight of this year’s event was a formal address by General Bontrager inside the historic Senate Chamber. General Bontrager spoke on behalf Major General Jeffrey Bannister, who is currently deployed, and all other division troops. During his remarks, General Bontrager shared an update on the 10th Mountain Division’s mission and also touched on the synergistic relationship that exists between Fort Drum and its surrounding communities. In addition, the Fort Drum Color Guard opened up the day’s Senate Session and a special invocation was delivered by Lt. Colonel Gary Fischer. The Senate also honored troops with a Resolution and following its adoption, a dozen lawmakers spoke in support of attendees, thanking New York’s “heroes” for all they’ve done in the name of protecting our freedom. 10th Mountain Division and Fort Drum Day has become a tradition that helps honor our troops, as well as teach the people of New York State about the important work they do.